Fully equipped cabin. Sleeps 6. One bedroom has queen sized bed. Second bedroom has full size bed. Also has couch with fold out bed in living room for additional sleeping. Full kitchen with range/oven, microwave and dishwasher, 2 full baths, barbecue grill on private deck and private firepit. Great views of Kachemak Bay, glaciers and the Homer Spit. Fully equipped cabin. Sleeps 2. Can be set with either a king bed or two twins. Fridge, coffeemaker, microwave, full bath (sorry no tubs), barbecue grill on private deck and community firepit. Great views of Kachemak Bay, glaciers and the Homer Spit. No pets allowed in the duplex. Fully equipped cabin. Sleeps 4. Can be set with either a king bed or two twins. Also has fold out futon for additional sleeping. Kitchenette, Full bath (sorry no tubs), barbecue grill on private deck and community firepit. 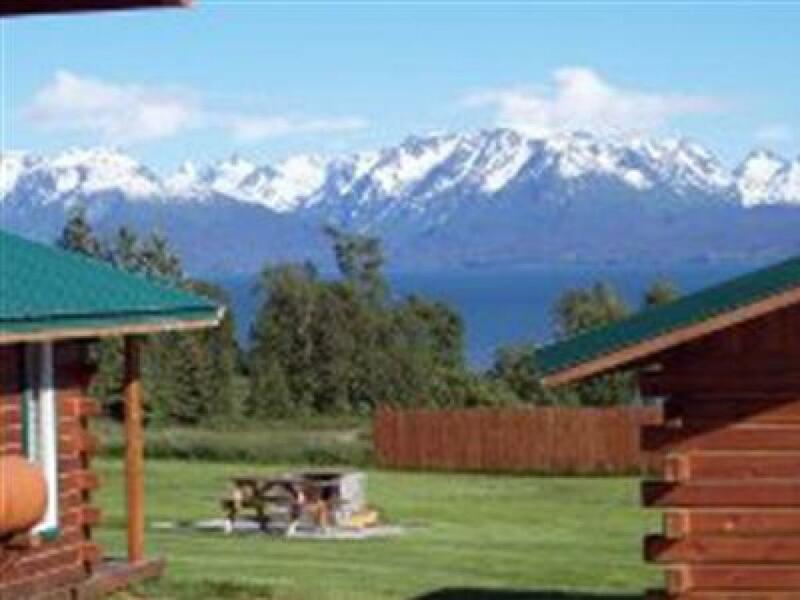 Great views of Kachemak Bay, glaciers and the Homer Spit. Five cabins with fully equipped kitchens, baths, satellite TV, barbecue grills and community fire pits. Two smaller cabins with microwave & fridge. Please specify in your reservation what type of bed you would like (twins, king, etc). Beautiful view of Homer Spit and glaciers across Kachemak Bay. For our visitors that don’t have navigation on their cell phones, directions to the cabins are below. Please don’t hesitate to telephone if you need further assistance. If you are driving to Homer, you will be on the Sterling Highway. The Sterling Highway becomes the Homer By-Pass when you enter Homer. Follow the road to the stop light which is the Lake Street intersection. Turn left (N) and at the flashing four way stop sign, turn right (E) which is East End Road. Follow the road approximately four miles. Glacier View Cabins is on the right side of the road. You’ll see the sign and cabins. If you are coming from the airport, turn left out of airport and then left again from Airport Drive onto Ocean Drive and the next left will be Kachemak Drive (directly across from lighthouse village). Follow Kachemak Drive all the way around to the stop sign. Turn right on East End Road. Glacier View Cabins is approximately one half mile further on the right side of the road.